Grab hold for a wild ride with this exciting, high concept thriller that tackles one of the big issues of our time. Reading this book was a treat. When I was asked if I would be interested in reading the Dark Seed I was a little sceptical because it doesn’t really fall into my choice of genres, but after reading the storyline I thought it a good idea to give it a go and I must say I am very pleased that I did, I found Lawrence Verigin’s writing style very captivating, the story pulled me in from the get go, once I took a break from reading I was left wondering what would happen next; In my book that is a very good sign.. Dr Carl Elles had a point to make and was determined to expose Naintosa for what they were planning on doing and have been doing for some time, It’s up to Morgan and Nick Barnes to carry out his wishes and that they do but not without ease, this book is filled with suspense, action and yes a little romance to. I would definitely recommend anyone to read this although it’s not part of your choice of genres you will be glad you did. Once again, a pacific northwest writer hits it out of the park! 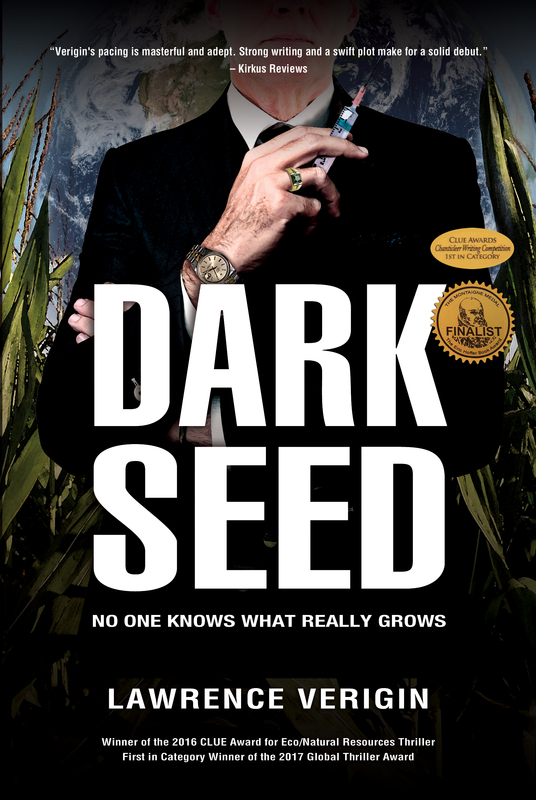 DARK SEED, the new novel by Lawrence Verigin, is a thriller about a disillusioned newspaper journalist in Seattle who is approached by a plant geneticist to write an exposé on the corporation he has spent his life doing research for. When he winds up dead under mysterious circumstances, our journey into a world of foul corruption and ever deepening conspiracy begins. This story touches a nerve as it weaves through the false guise of world food supply betterment through genetic research, as modeled by a number of corporate entities, and the totally dangerous and out of control commodities they produce. Mr. Verigin brings to light these truths with style, grace, and plenty of thrills and chills that kept me tuned into the bigger truth all the way to the end. I love all his characters, and the creepy faces of the corporate mercenaries smacked of total amorality. This is a world class read and very highly recommended! The author did a wonderful job of bringing a socially relavant subject to light in a fascinating, well plotted novel that kept me reading late into the night. Verigin’s descriptions of the Pacific Northwest locations made me feel I was right there and feeling the cold Canadian winter right along with the heroes. The main characters have a depth to them that makes them totally believable, and the growth they display over the course of their ordeal makes for a satisfying ending, even if some questions are left unanswered. I’m looking forward to the sequel! Dark Seed is a book that hooks you in the very first few pages and keeps you wanting more, even after the last page has been read. 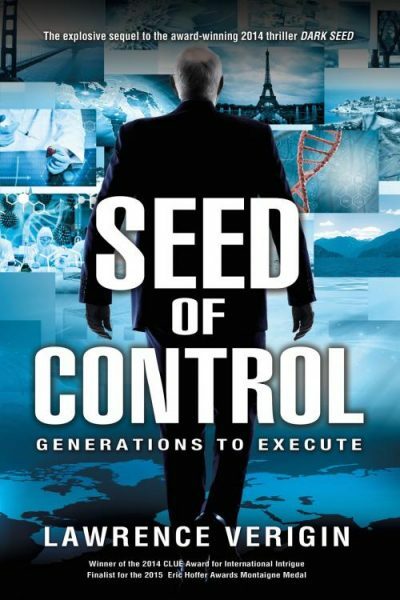 Not only is this thriller entertaining on a fictional level, the theme is relevant and eye opening regarding today’s controversy surrounding genetically engineered foods. The characters are relatable, the plot is engaging and the suspense keeps you on the edge of your seat until the very end. I highly recommend this book to everyone, it is a great read. 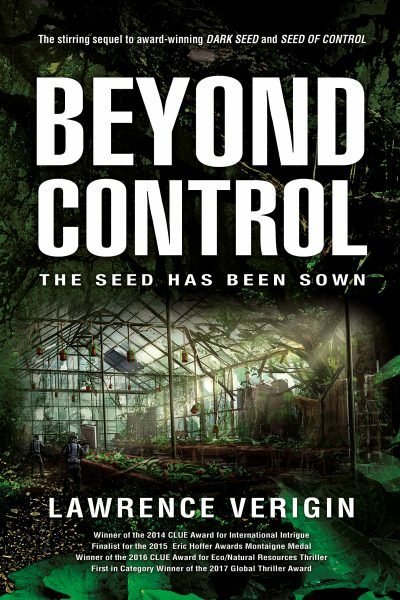 Lawrence Verigin did his homework on the very important subject of GMO foods and the result is a thriller that you can’t put down. I thoroughly enjoyed it and recommend it to anyone who wants to be entertained by a quick read on an environmentally relevant issue! Lawrence Verigin’s “Dark Seed” is a gripping and socially relevant thriller. The plot, about a journalist working to uncover the truth behind a large corporation’s genetic modification of the food supply, packs a very relevant punch, much more so than the average suspense novel. The tightly-plotted story moves along at a brisk pace, and the characters are vividly drawn. The tension ratchets up as the lead characters, a journalist and the daughter of a murdered researcher, get closer to exposing the truth about a shadowy family’s involvement in the genetic tampering of crops. There is a sinister vibe throughout and surprises keep coming till the end. Really well done. Looking forward to the author’s next work. In Verigin’s debut thriller, a journalist takes on the story of his career when he agrees to write a book exposing the corruption and deadly dealings of an agribusiness giant. Disenchanted with his work at the Seattle News, Nick Barnes is intrigued when he is approached by Dr. Carl Elles, a former scientist at agricultural company Naintosa. Although Nick had just written a positive article on Naintosa’s genetically engineered vegetables, the doctor convinces him that not all is as it seems with these supercrops, and the two arrange a meeting to look at Elles’ notes. When Nick finds him dead in his office, he can’t shake the thought that something is amiss: An imposing man claiming to be a police lieutenant arrives on the scene well before any other police officers, and a gray car seems to be following his every move. Nick doesn’t start putting the pieces together until he meets with Morgan Elles, daughter of the late doctor. Assuring Nick that she has copies of her father’s notes, she convinces him to continue with the project and write the exposé. Nick agrees, and the two set out on an international game of cat and mouse with the thugs who will do anything to stop them. Throughout the story, Verigin’s pacing is masterful and adept. He imbues Nick with self-deprecating humor and intelligence, lending him a credibility that makes even the occasional red herring a little more fun. Readers may find the perfectly beautiful Morgan less nuanced, and while Nick’s attraction to her is understandable, some may tire of his frequent descriptions of her outfits. Dialogue is lively and realistic, an asset in maintaining the suspense. I love a good thriller and Lawrence Verigin did not disappoint with Dark Seed! I admit, I was hooked after reading the book’s synopsis. Monsanto, farming, and talk of GMO’s can be found circulating throughout daily media. It’s a major issue in our world and one that personally freaks me out. Nick Barnes seems to be your average journalist who falls into a complex situation of battling scientists and genetically modified food experiments. A company that portrays themselves as doing good for the planet is actually a very secretive and destructive organization. I feel the characters realistically reacted to dramatic situations. They didn’t go from common human to crime-fighting heroes in a split second, there was a believable evolution of their character. I enjoyed riding the roller coaster ride of emotions and events with the characters as they attempted to uncover the ecological mystery. Dark Seed is a nail-biter and will have you reading non-stop until the end. Even then, part of the story is left open which means we need Verigin to finish up a follow up to this thriller asap. I received a copy of this book from the author as part of the Good Reads First Reads program. Thank you Lawrence! It was a great read. This book will terrify anyone with doubts about GMO foods. I wasn’t sure what to expect from a story about genetically engineered food but I wasn’t expecting a mystery/thriller. Many of the premises put forth are in line with the opinions of extreme GMO opponents. Do GMOs really cause allergies, cancer, and other horrible diseases? I have no idea, but this book certainly makes it sound plausible. Of course there is the requisite mystery group of people intent on controlling the world for their own nefarious purposes but that’s more of a side plot than the main story. The main characters spend the entire book running from the mysterious organization that’s trying to kill them in order to prevent them from writing and publishing an expose of how their GMO products are killing people and the environment. The star of the story is really nature itself and the horrific effects caused by tampering with it. I haven’t done much research on GMO food, though I’ve always fallen slightly closer to the “organic non-GMO” side of the argument. After reading this book, I think I’m a little further over on that side.